The Crew on board Ruya were hand picked by the owners for their depth of knowledge in their field, strength in social skills and their understanding of the quality of customer service to meet your highest expectations. Walter has cruised extensively through the Mediterranean and Caribbean, crossed the Atlantic eight times and completed over 45,000 nautical miles around South East Asia and the Pacific Ocean. Walter brings a wealth of experience and enthusiasm to Ruya. He takes pride in his ‘off the beaten track’ sea miles, as expedition yachting is becoming his specialty. JOB DESCRIPTION: Walter is responsible for the ultimate safety of the guests, crew, environment and the vessel, legal and regulatory compliance, navigation, guest liaison and crew management. Born and raised in Fiji, Sandra spent 5yrs as a Flight Attendant before joining the yachting industry. Now with over 10 years experience in the industry, Sandra's creativity, excellence in service and attention to personalized detail ensures that guests will have the best experience while onboard. Main responsibilities include: service leader, galley and guest liaison, meal and event planning, purchasing and inventory. Sandra manages all interior crew and duties including cleaning, maintenance and laundry with an emphasis on guest service and training interior crew. Natalie’s life began on the water in South Africa, cruising the world on the family yacht Lily Maid. After a two-year stint in the UK studying hospitality, Natalie began working on superyachts. Having worked on yachts since she was nineteen, Natalie’s past experience will ensure your time onboard is one to remember. JOB DESCRIPTION: To support the Chief Stewardess with guest service, training of interior team, detailing and maintaining the interior. Luke’s first introduction to working within the marine industry was as an apprentice boat builder for Sunseeker International back in 2006. Since completing his apprenticeship, Luke has worked on many motor and sailing yachts. 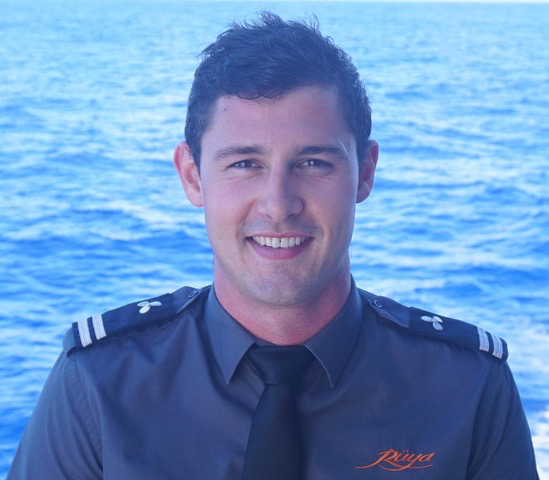 He has gained a enviable knowledge of onboard technical and mechanical systems. JOB DESCRIPTION: Responsible for the ultimate smooth operations, safety and maintenance of the yacht services, managing and supervising engine repairs and overhauls. In early 2018, with 7 years’ experience in workshops as a mechanic the thirst for travel took Campbell to the UK with the idea of combining seeing a bit of Europe and gaining yachting related qualifications. Campbell he is currently working towards his Y1 qualification to continue his engineering development. JOB DESCRIPTION: To support the Chief Engineer with all engineering operations, with an emphasis on all main and secondary systems. Also responsible for maintaining the cleanliness and polishing of the yacht and to assist the First Mate in maintenance, repairs and guest service. At the age of 8, Mike started sailing in his hometown of Durban, South Africa and quickly showed his talent for regatta racing, making a move up into the Olympic 49’er class in his early teenage years. Michael will ensure guests enjoy being in the water and have fun! JOB DESCRIPTION: Detailing and maintaining the exterior of the yacht and to assist with guest service. Completing her Officer of the Watch (OOW) and dive instructor qualifications in 2012, Olga moved to an expedition boat as Bosun where she spent 2 ½ years based in South East Asia and the Pacific. Wanting to continue with her education in Yachting, she completed the Chief Mate modules in 2016 and has progressed into Chief Officer roles that have taken her between Croatia, Egypt, Caribbean and the Pacific. JOB DESCRIPTION: To assist the Captain with administrative and navigation duties, Safety and Security Officer on board, Guest liaison, and leader of the deck crew. Philip’s skills moved him to a fine dining restaurant at 20 years of age in Cardiff learning from the very experienced head chef. The travel bug took Phil to Sydney’s gastronomy scene, which gave Phil a taste for modern food and management as head chef of a Gastropub. With a passion for fresh local produce, original menus and patisserie, Phil provides a nutritional experience, with beautiful presentation that accentuates the flavours. JOB DESCRIPTION: As Chef, Phil is in charge of all menu planning for guests and crew, inventory and provisioning, nutrition and food safety standards. Prior to yachting, Leah worked as an office manager and family assistant in the wine, coffee and fine food industry. At the same time, she maintained her own successful business utilising her professional qualifications in Myotherapy, beauty therapy and business management. Leah’s versatile skills, knowledge, kind and bubbly nature will ensure you will feel at home and enjoy your time onboard Ruya. JOB DESCRIPTION: To support the interior team with guest service, cabin service, laundry, detailing and maintaining the interior.